Andrew M. Smith started the blog in April 2007, after he moved back to Seattle and discovered there was a campaign for light rail that year. Andrew grew up in Scotland, Capitol Hill and Wallingford, and has lived in Tokyo, where he discovered his love for transit and walkability, and San Francisco. Andrew stepped down from the blog in May 2009 but returned in February 2011. 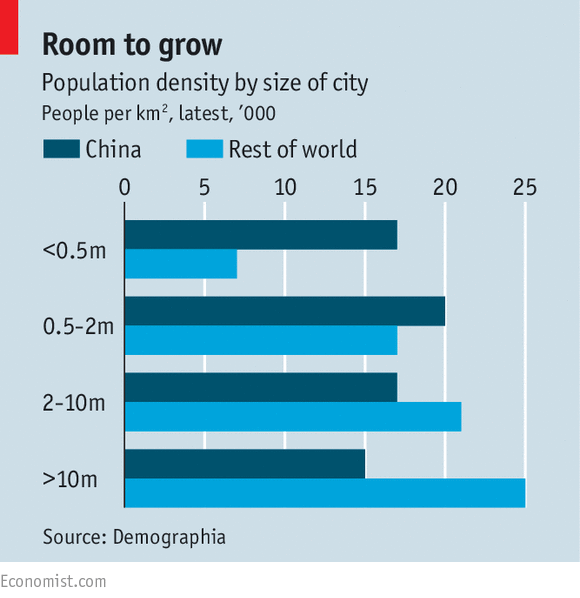 This is an interesting read on urbanisation in China. In honour of the Shinkansen’s 50th anniversary, the Guardian has a very interesting article about the Shinkansen – the world’s first bullet train – and it’s transformative effects on Japan. The article helps shed some light on how major infrastructure projects can change the face of their environments, for better or for worse. While reading this article, keep in mind that Japan has extremely high road tolls, which help explain part of mass transit’s popularity there. Comparing this to our nation’s major post-war infrastructure project, the Interstate Highway system, and you see interesting parallels and contrasts. Both allowed the expansion of developed areas to accommodate the post-war baby boom. The Shinkansen and suburban commuter lines* have served to super size Tokyo into a super-dense, walkable metropolis. Stations on the lines become commuter hubs, each with their own walkable urban villages. The focus on Tokyo has also driven up that city’s important, at the expense of some of the smaller cities. On the other hand, the Interstate System and the US highway system before it have allowed people to move out to far-flung areas as well, but in low-density, auto-oriented sprawl. They’ve also driven down the importance of the US’s traditional major cities (New York, Chicago, Boston, Philadelphia, etc.) while driving up the importance of some of the newer upstarts (Atlanta, Houston, Phoenix, San Diego). Looking forward, it’ll be interesting to see what the long-term effects are of all of the infrastructure spending in China. There they are building more bullet trains than Japan, more highways than the US, and more subways than all of Europe put together. Where will all of those billion plus people live at the end of all of that? Anyway, the whole article is interesting, and there’s a bit about the Shinkansen’s future – maglev – at the end. 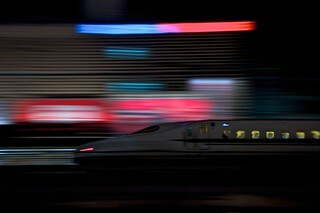 Oh, and happy 50th birthday, Shinkansen! *Several years ago I wrote a post about how suburban rail lines created dense sprawl in the Tokyo Metro area (the great Kanto Plain). 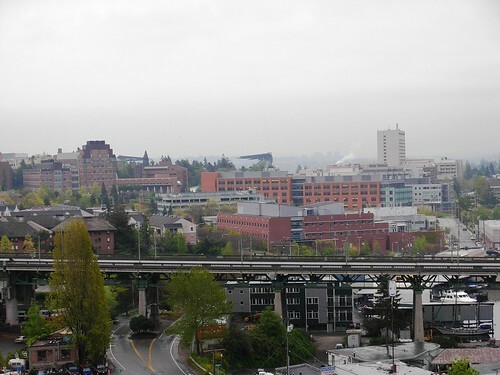 The comment period on the U-District Urban design has been extended until Monday, and I strongly encourage STB readers to provide comment on the documents as whole and the three zoning “alternatives” in particular. I’ll briefly summarise the three options below, as well as give my personal opinions, but I recommend you have a look over some or all of the documents if you have the time. Either way, please send comment to dave.laclergue@seattle.gov endorsing either alternative 1 or alternative 2. Thanks! 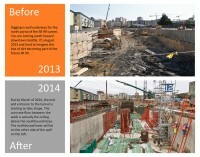 These images are of the meagre progress the tunnel project has made. Images courtesy WSDOT. 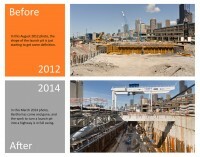 The TBM will be stuck for nearly another year, restarting only in March. Assuming it does become unblocked by that date, the machine would have been blocked for 16 total months. That will lead to a 14 month delay for a tunneling project that was meant originally to take 14 months to complete. The repairs to Bertha are meant to cost the tax payer another $125 million. Keep in mind, this is to repair a TBM that cost $80 million to begin with. The state has refused to pay this, though who will ultimately pay for any cost increases is certain to be only decided in court. However, we’ve learned that one of the construction companies behind the tunnel has a decades-long history of suing to get extra payments from public agencies. They successfully deflected blame when projects have gone sour, and have forced government agencies to spend millions in court and legal fees. The company is already asking for $62.6 million in change order, and that figure is not a part include the previously mentioned $125 million. The original tunnel contract was for just over $1 billion. None of this is very surprising, but what is surprising is that state transportation secretary Lynn Peterson is now saying there’s a “small possibility” the project could be cancelled. Now, I don’t know if these statements come from a bargaining position or an earnest assessment of the situation, but I hope more people wake up to the possibility of cancelling this project sooner rather than later; this project is unnecessary and promises to be a money pit far into the foreseeable future. Let’s cancel it now rather than throw more good cash after the bad we’ve already buried in this tunnel. Vignelli Transit Maps by Peter B. Lloyd and Mark Ovenden is the story of Massimo Vignelli’s famous (infamous?) 1972 map of the New York City subway system. 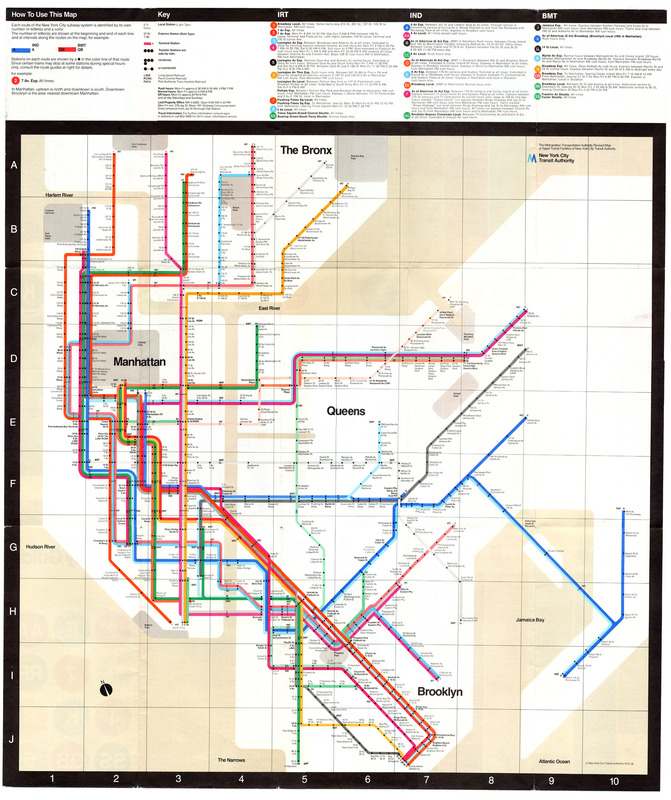 The map was controversial because it ignored geographic and station location and stuck to a strict 45- and 90-degree grid, and was eventually replaced by the MTA in 1979. You can see a high-resolution image of the map here. The book covers the story and people behind the map, as well as the importance of transit maps and how they are designed. There are a number of interesting details on map features such typeface, colour, and cost as well as lovely images of the maps. Where the book does fall a bit short is on answering the question of whether the map was better or worse than those that came before and after it. Even though the book is rather large, some of the maps are illegible because they require even larger formats. I think Vignelli Transit Maps is a nice companion to the 2007 work Transit Maps of the World . The former will give you some of the tools to help understand that thoughts that went into some of the later. I picked up my copy of Vignelli second-hand for much less than the Amazon price, but I would say it’s worth it if subway maps are an interest of yours. French Economist Thomas Piketty’s Capital in the Twenty-First Century has been translated into English by Arthur Goldhammer, and it has made quite a stir. Paul Krugman’s review is probably the best, and Matt Yglesias’s is the best “TL;DR” version. To summarise briefly, Piketty studied wealth (capital) growth in the nineteenth and twentieth century and has concluded that without considerable government intervention the 21st century will look a lot like the Gilded Age. That is, wealth will continue to accrue only a very select few at the top of the wealth curve (the “.01%” you could say), and that eventually elites will inherit all of their wealth, with little chance of a change in social status between generations. Piketty says this undermine democracy and turn society into an oligarchy, if it already hasn’t. What does this have to do with transportation? Well, capital and wealth accumulating to only a few is scary enough, but I think it also helps explain one of my pet subjects, the decline in infrastructure across the United States. Public infrastructure is capital as is any other. With all wealth accumulating to just a few, there’s less money left over for big public infrastructure projects, which is why the interstate system could be built in the middle of the 20th century, but a project of that scale is completely unimaginable today. Piketty does not go into any detail on this subject, nor does any of the commentary on the book, but it’s worth keeping in mind as an explanation for why it’s so difficult to even keep public buses funded. As an aside, I do recommend Capital in the Twenty-First Century , even though it’s not the easiest read. Update — As Cody pointed out, it might be nice to link to the actual article. Also, the original version of this post misspelled Ms Cutler’s second name. Last week, Techcrunch’s Kim-Mai Cutler published an excellent – and detailed – summary of the history of housing, affordability and the housing development environment in the Bay Area. You may not be aware, but in the Bay Area in general and San Francisco in particular there has been a growing movement of people who are unhappy with gentrification and rising rents that they believe has been caused by the tech industry. 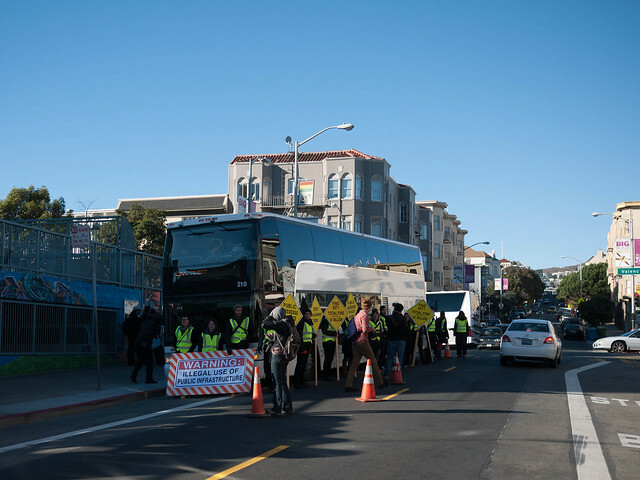 Protesters have been blocking and vandalising Google buses and have even been known to harass Google employees at homes (full disclosure, I work for Google in Seattle). I highly recommend the post, it’s truly excellent, and a few interesting titbits jumped out at me, and I thought I would share them. Homeowners have a strong economic incentive to restrict supply because it supports price appreciation of their own homes. It’s understandable. Many of them have put the bulk of their net worth into their homes and they don’t want to lose that. So they engage in NIMBYism under the name of preservationism or environmentalism, even though denying in-fill development here creates pressures for sprawl elsewhere. They do this through hundreds of politically powerful neighborhood groups throughout San Francisco like the Telegraph Hill Dwellers. Then the rent-controlled tenants care far more about eviction protections than increasing supply. That’s because their most vulnerable constituents are paying rents that are so far below market-rate, that only an ungodly amount of construction could possibly help them. Plus, that construction wouldn’t happen fast enough — especially for elderly tenants. So we’re looking at as much as 80 percent of the city that isn’t naturally oriented to add to the housing stock. Should we continue with Bertha? 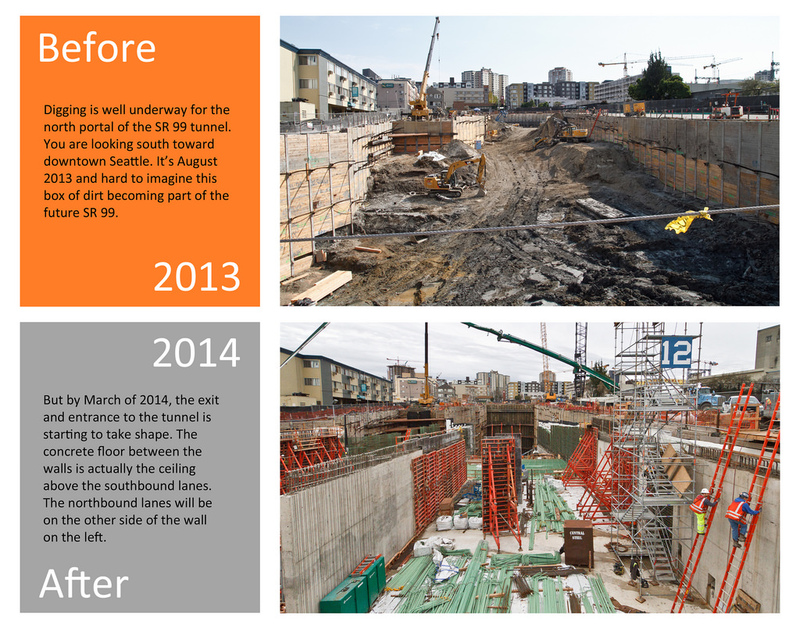 Sightline’s Clark Williams-Derry analysed traffic data from the Alaskan way viaduct and noted this precipitous drop. Image from Sightline. Click for more information. 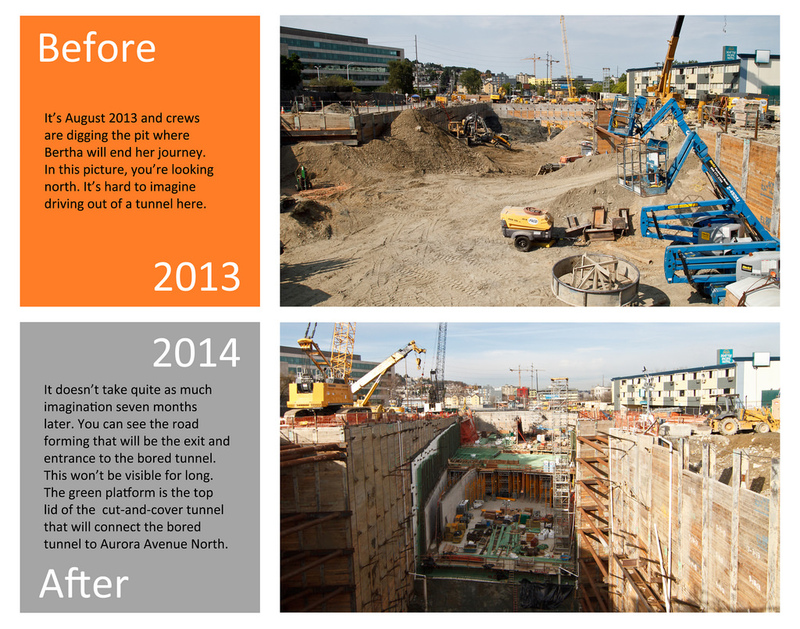 Bertha, the tunnel boring machine (TBM) has been more or less completely blocked since early December. The TBM was damaged in part by a metal pipe WSDOT installed to study this tunnel project’s feasibility. 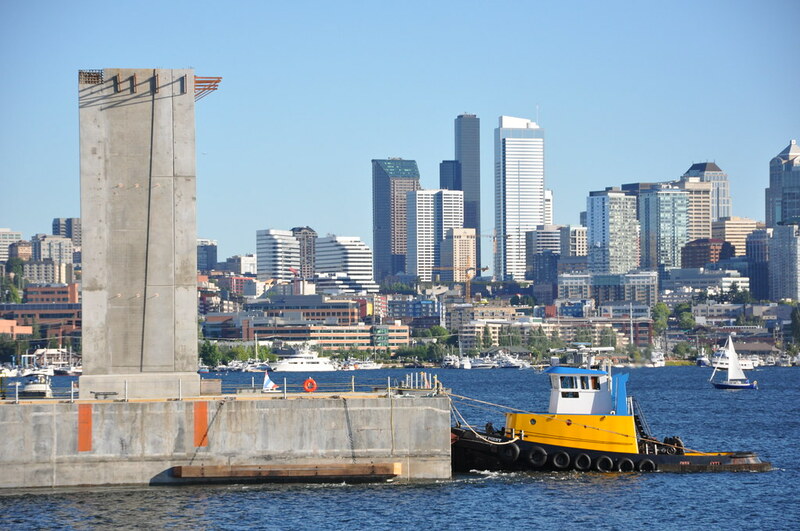 The tunneling won’t start again until the end of the summer, with the tunnelling contractor, Seattle Tunnel Partners (STP) hoping it will begin by Sept. 1st at the earliest. The TBM had problems early on, during testing after construction in Japan. Internal reports from the STP and WSDOT show that there are more problems with coordination and oversight. It also shows that the tunnelling was never on track, even before the current stoppage. 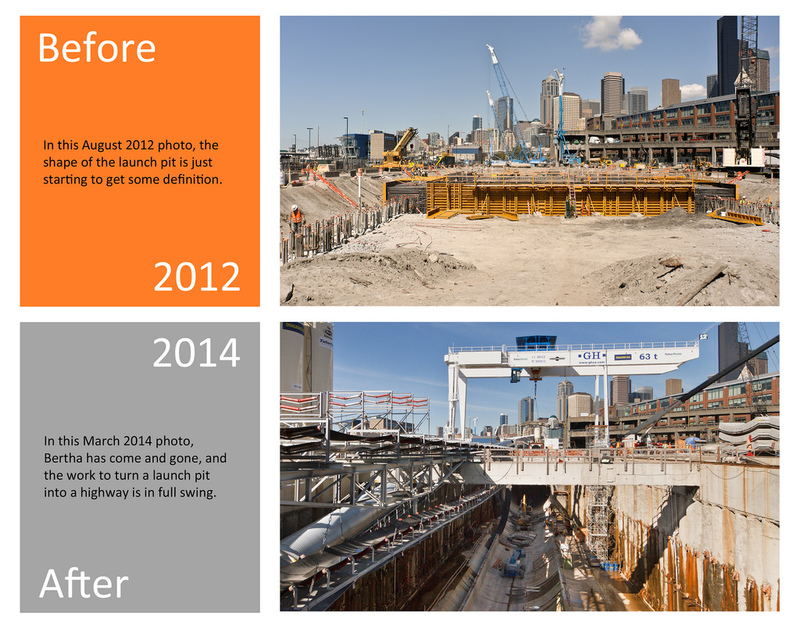 Viaduct traffic is down 40% in the past three years. In order to raise the needed tolls to help pay for the tunnel, more trips would need to go through the tunnel than currently travel the viaduct. 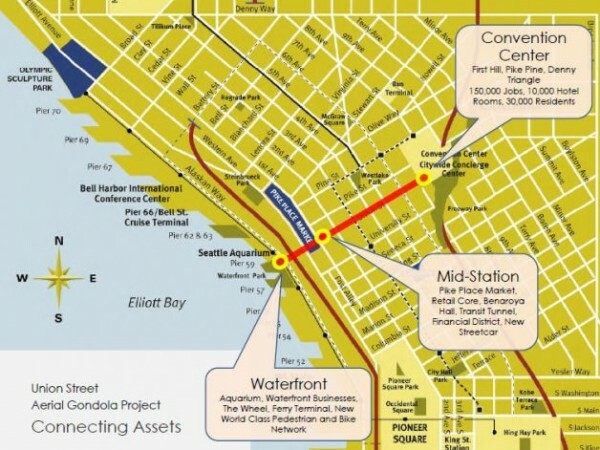 It’s worth noting the viaduct serves more locations than the tunnel would. WSDOT’s traffic projections have been off, as traffic as been declining on all roads, rather than increasing. There’s also confusion over who will pay for the now-certain cost-overruns. Potential Route map. Image from Great Western Pacific. At a news conference, Griffith said the system would run east and west; be privately financed; require no tax dollars; pose no risk to the city; and bring people into the waterfront area of the city, a region that is now difficult to access due to lack of parking and continuing construction. The cars are supposed to be 40 or 50 feet off the ground, which would pose privacy issues for any apartments or condos on that street at or around that height. No word yet on how much a trip would cost, or whether an Orca could be used. The system would be paid with private financing, but use the public right-of-way. I think a gondola there is a great idea, but I think there might be better ways to get it than let a private developer finance, build it, and operate it. With private operations, the system is likely to be a one-off, and the trips are likely to be rather expensive. I wonder if there isn’t a way to get this paid with private money but operated publicly. Last time I was in London, I rode the “Emirates Air Line” (different from Emirates Airline), a gondola that opened in London for the 2012 Olympics. The gondola was originally meant to be entirely privately financed, but the project went significantly over-budget. In the end, Emirates Airlines paid £36 million of the £60 million price tag in exchange for 10 years of “branding” of the line, which is included on Transport for London rail maps along with the Underground, the Overground and the Docklands light rail. Now, Seattle’s not London, and we’re not hosting the Olympics, but there may still be a way to get this or other gondolas paid for without significant public expenditure while still maintaining public ownership. The best thing about contracts for naming rights is that they can expire. What do you think? Is it worth it to let a private company put their own fixed infrastructure over the public right-of-way? 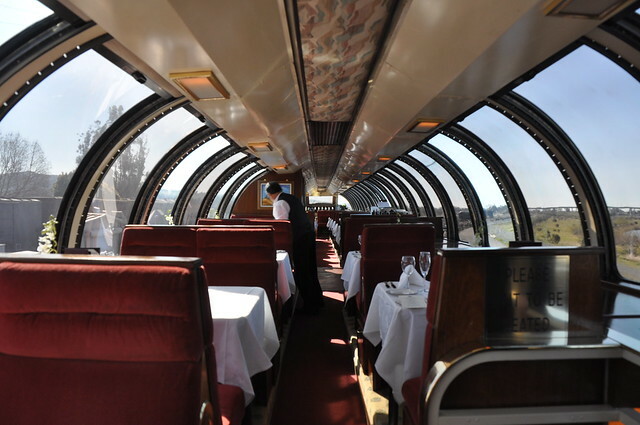 Amtrak has started a “writers’ residencies” program that would allow free rides for writers on long-term train rides. The first such residency went to Jessica Gross, who wrote about her experience in the Paris Review. The Wire has many more details about how the program started and how it might work in the future. It’s worth noting the number of residencies are limited, but I think this is a great idea. Personally, my best writing* is done when I am completely alone, and I can imagine beautiful scenery might help spur the imagination. What do you think? Is this good advertising for Amtrak or a waste of funds for an agency deeply in debt? *Though I’ve never had anything more than a short story published. Upton Sinclair said “It is difficult to get a man to understand something when his salary depends on his not understanding it.” Here are official USDOT vehicle forecasts compared to actual traffic data. Note that only March 2001 to November 2001 and Dec 2007 to June 2009 were recessions. 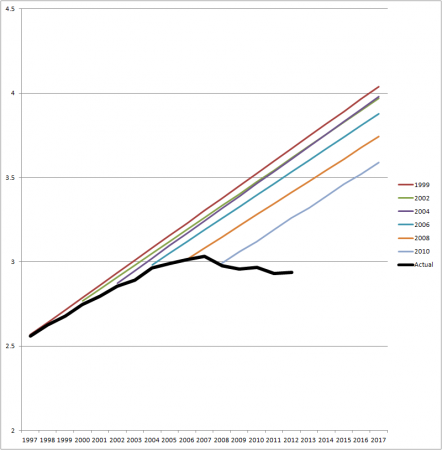 More over at Sightline, who provided the graph. This is actually important, because we wouldn’t think we need huge highway mega-projects if it weren’t for these forecasts. The tunnels would be $1 for off-peak and $1.25 for preak, because anything higher would be an extreme deterrent to using the tunnel. 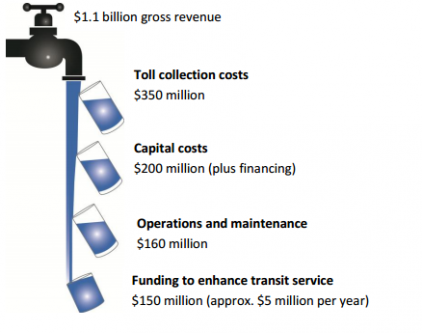 About a third of the tolling money would be eaten up with collection cost. Over 30 years, $150 million would go to transit, or $5 million per year. In order to raise $1.1 billion off a $1 toll, you need a billion trips, which over 30 years works out to 91,300 a day or so. That seems a little high to me, but we’ll see. If their estimates are anything like the SR-520 numbers, it’s going to be tough to get all that money. If the toll revenue comes up short, I would hope that the transit funding is preserved, but I guess will have to see about that, too. In my post Saturday on project management challenges at WSDOT, I included a photo with a caption suggesting the coffer cell was not supposed to fall over as depicted. Although it was an attempt at levity, the coffer cell was indeed intended to fall over. You can find more information on the coffer cell here. I have corrected the original post and regret the error. While we’re on the topic of WSDOT’s photos, I recommend their flickr sets. In particular, this one on the SR-99 tunnel has some really impressive shots. Correction January 13th: Originally this said the coffer in the photo about was not supposed to fall-over that way. It was supposed to fall over that way. Apologies for the mistake. Our state’s transportation agency, WSDOT, is having some serious problems on two of its three “mega-projects*” in the Seattle area. I think the problems highlight a number of problems in the way we plan, price and green-light these large highway projects, and really continues a long track record of weakness in the agency itself. Cost increases on the new Highway 520 bridge not only will drain the megaproject’s entire contingency fund, but could require money to be shifted from other road work, Transportation Secretary Lynn Peterson told lawmakers Wednesday. These costs are apparently related to cracks in the pontoons and the delays these cracks have caused. This is merely the first cost overrun of what I am completely confident will be many for the project whose completion date has already slipped from 2014 to 2016. 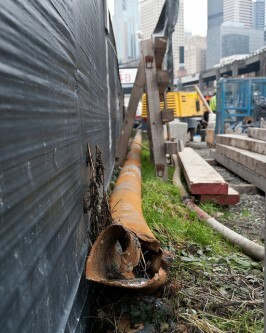 This pipe is costing you millions of dollars. Photo Courtesy WSDOT. WSDOT’s other problem is a pipe blocking “Bertha”, the tunnel boring machine building the Alaskan Way Viaduct replacement. Bertha became stuck whilst boring and apparently there are a lot of complications getting the entire pipe out because of Bertha’s size and position relative to the pipe and its location. The 2002 well site was listed in reference materials provided to construction bidders, as part of the contract specifications. “I don’t want people to say WSDOT didn’t know where its own pipe was, because it did,” said state spokesman Lars Erickson. However, Chris Dixon, STP’s project director, said the builders presumed it had been removed. Who’s reviewing these plans? Isn’t some one there to ensure the plan has taken into account all the information? Who’s there to look at the tunnel plan, check against the soil map they presumably used to plan the tunnelling and say “hm, better make sure this pipe has been removed”. No big deal? We’re only spending billions of dollars here. And why is WSDOT leaving 119-foot steel pipes in the ground anyway? By my very rough calculation, the pipe itself is $15,000 worth of scrap steel** (I’m sure WSDOT spent much more). Now we’re wasting millions getting out of the ground. 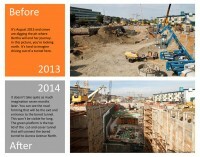 WSDOT has a poor record building large projects going back decades. Galloping Gertie famously collapsed in 1940. The Hood Canal Bridge sank in 1979. 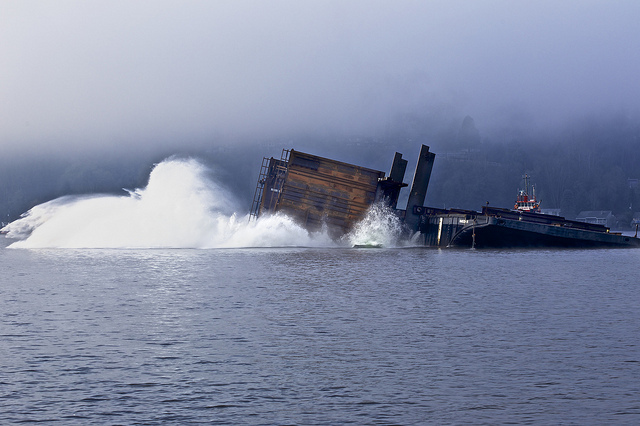 The I-90 floating bridge sank in 1990. The 520 replacement already has cracked pontoons years before it’s scheduled to open, and the Tunnel Highway is blocked by one of WSDOT’s own pipes. Unlike Sound Transit, who seems to be getting better at building train lines, WSDOT doesn’t seem to be capable of learning from its mistakes. * The other is the 405 widening. ** You could say something about being “green” and recycling if you wanted to. One More Take on Regulating Uber, etc. Matt Yglesias has hit exactly on what I was feeling when I read the city’s rideshare regulation proposal. The regulatory issue around Uber is whether the rules governing rides-for-hire need to be drastically different than the rules governing driving-yourself-around. And my answer is always the same: Of course there are significant public safety concerns about people driving vans. But the concerns are essentially the same whether it’s a delivery van or a dollar van. You need rules about what’s an acceptable vehicle, who’s an acceptable driver, and what’s an acceptable way to pilot the vehicle. But you don’t need rules that specifically discriminate against rides for hire. The right way to think about this panoply of rules is that it’s all part of a regulatory structure designed to make single passenger automobile traffic and one-car-per-adult the normative American lifestyles. Anything you want to do around driving yourself is presumptively legal, and anything you want to do around hiring someone else to drive you is presumptively illegal. That’s a worldview that’s bad for the environment, bad for cities, bad for the poor, bad for many classes of physically impaired people, and all-in-all bad for America. But by all means, regulate cars-for-hire. Just regulate them the same way you regulate the other cars. I don’t have too much to add to this, other than you can legally drive around in a 1959 Malibu if you’d like, even if they aren’t very safe (see video). 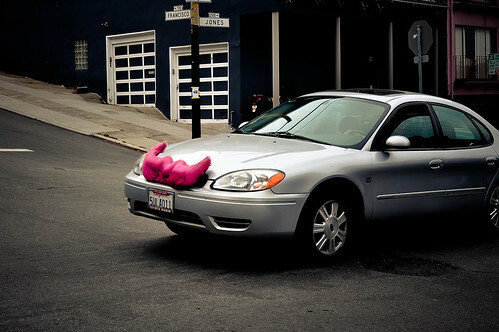 A lyft vehicle in San Francisco. Photo by Spiro Vathis. Last week, the city council published a proposal for a regulatory scheme for ride-share services such as Uber, Lyft and Sidecar. While the scheme would take currently illegal services out of the grey market, the proposal is truly terrible. I won’t go into details of the regulations, you can read those at the link above or this Seattle Times article ($), this Geekwire article (which has the best summary of the regulations) or this Publicola post. It seems clear the proposal’s intention is to appease incumbent taxi and car-service providers by essentially running these new-services out of Seattle by putting onerous and arbitrary restrictions on their operations. I’ve never used Lyft, Sidecar, Uber or other ride-share services. I don’t take taxis either, generally. I usually try to plan ahead to make sure I either can take a bus or walk if I’m not going to drive. I can see why these services exist, though. Taxis are terribly expensive and never around when you need them. I’ve waited on the phone for more than 45 minutes just to request a cab before, for the cab to only show up an hour after the call. I’ve been in a taxi that blew a tire on I-5, pulled off the freeway and left me to walk the rest of the distance home, some five miles – lucky me I’m young and in good shape! Imagine if I had been a mother with children and shopping bags. I’ve been in taxis that have tried to charge me extra when we got to the destination because they couldn’t pick up fares there. I’ve also been in cabs that have gotten completely lost and driven miles in the wrong direction, all on my dime. So I understand why people want competition. We know there’s a public-safety issue late at night when the small number of taxis is insufficient to take home the number of people too drunk to drive. Try calling a cab on New Years’ at 2am. I can imagine someone, faced with the option of waiting a couple of hours for an expensive taxi ride, deciding to instead drive because they’re only a “little drunk”, which is really the worst option available. Reducing the number of available drivers and cars can’t help this problem. Now, there may be a public safety issue the other way, with unqualified people picking up strangers and driving them around. But, presumably, these are people we let drive now, cars we allow on the road already, and passengers capable of making their own risk decisions. If someone is out to cause trouble and kidnap someone, for example, there are likely less troublesome ways to do it then sign up to be a Lyft driver. At the end of the day, this is the populace and consumers of Seattle vs incumbent taxi drivers. I’m for anything that reduces the need to have cars, saves people money and increases public safety. You’d think the city-council might have similar desires but, sadly, they seem more interested in protecting special-interests. The driver tried to get me to pay for the distance up to that point, if you can imagine that. Surely, another sign of a broken regulatory scheme. Does riding public transit make you happy? What does this sushi have to do with transit? Let me tell you. Photo by localjapantimes. The first point is not at all surprising. People who eat sushi probably have higher opinions of sushi than people who don’t eat sushi have, too. The second is also not hugely surprising. People who can ride transit but don’t must have low opinions of transit to start with, and low opinions can probably only go up. Similarly, people who don’t eat sushi because they think raw fish is gross, might be surprised to see there’s other stuff, asparagus tempura rolls for example. So from the outside number three might seem surprising, but not, I think, when using my tired and stretched sushi analogy. 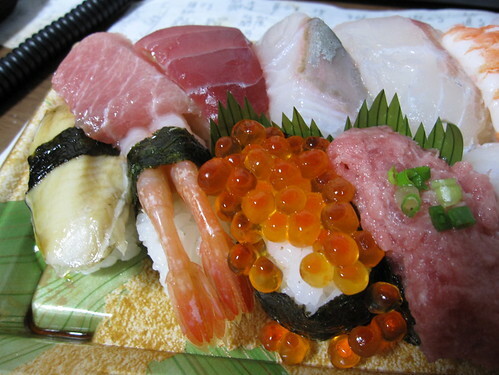 If you think you won’t like sushi, try it, find out you actually really like sushi, you are going to be pretty happy. Here’s this whole new thing you didn’t think you’d like but do. The world is full of new great things, you might think. This goes back to my point some time ago that Americans don’t like utopias that don’t have cars in them. If your whole life you grew up eating fish and chips and thinking (maybe being told) that sushi was something other people did and it wasn’t for you, you might not want to imagine a future where people ate a lot of sushi (I may have certainly laboured this one to death, now). So people who grew up being driven and driving, people who only see buses as obstacles to getting to their destination faster, I can easily imagine them seeing the world as a happy place when show how nice transit can actually be. How applicable a study from bus-riders in southern Sweden is to people in Seattle is not totally obvious; presumably these guys didn’t have to ride the 358. Still, it seems the simplest thing to getting people to want transit or cycling infrastructure may be just getting them out of the car the first time. 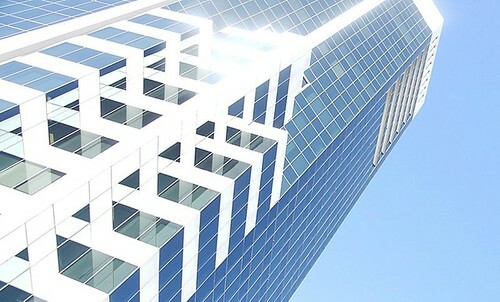 A highrise in Surfers Paradise. Photo by Erik Veland. When I set out to tell this story for Op-Docs, I came to realize that the history of the high-rise building is in many ways the history of humanity. I was faced with a daunting challenge: how to tell a 2,500-year global history in a short film? The solution was to expand the project into an ambitious four-part interactive series. I was inspired by the ways storybooks have been reinvented for digital tablets like the iPad. We used rhymes to zip through history, and animation and interactivity to playfully revisit a stunning photographic collection and reinterpret great feats of engineering. I really enjoyed it; let me know what you think. In the New York Times, Daniel Duane asks whether it’s okay for drivers to kill cyclists and the answer from a law-enforcement standpoint seems to be that it largely is. Yikes. I gave up biking to work within a week of starting. Cycling is fun and great exercise, but cycling on city streets is far too much like a very high-stakes game of Frogger. I seem to get hit or nearly hit by cars at least once a month while running on sidewalks. I find this completely unacceptable. 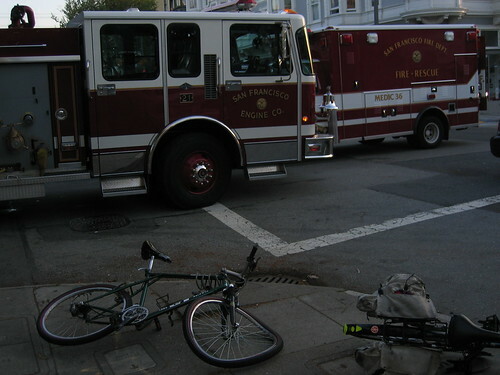 On a bicycle, I had a hit or near-hit experience every ride, often multiple times per ride. I found cycling on city-streets so frightening and dangerous that I still can’t believe anyone does it. What good is exercise and green living if it kills you? We need really tough laws to protect cyclists, and sadly, it seems we’re a long way from that. Sure, I’ll sublet your apartment with plywood boards instead of windows, please. As I mentioned, Kshama Sawant has come out for rent control, which is a bad idea (I am, however, very appreciative of Sawant for bringing low-income and poverty issues to the front of the debate). I would now like to turn my attention to Sawant’s arguments for rent control, talk about why they are weak, and show why her method of defending her position is a cause for concern. STB asked the Sawant campaign to clarify her position on rent control after the debate last week, and I’ve quoted a few parts of that response. According to Federal standards, housing qualifies as affordable if its total cost does not exceed 30% of the household’s gross income. By this standard, a single parent working full-time, year-round at Washington’s minimum wage of $9.19/hr can afford no more than $477.88/month in rent. At $15/hour, the minimum wage we are demanding in our campaign, this threshold of affordability jumps to $780/month. Even this is a far cry from $2100/month, the figure that represents the median rent of a two-bedroom apartment in Capitol Hill. A single-parent who works full time at minimum wage qualifies as “extremely low-income” and would move to the top of the waiting list for low-income housing in the city. They would also receive a housing voucher worth a non-trivial amount, some cases as much as rent. So hopefully this person would not try to find an apartment on Capitol Hill on their own without subsidy. Hopefully this person can also improve their finances by getting EBT. I don’t believe this system is perfect or that we have enough low-income housing or resources for all involved, but I believe this is the way to attack the problem of low-incomes using existing programmes and has nothing to do with rent control. A great way to get more money for these programmes is to increase the property tax base by allowing more construction, as the local funds for these programmes largely come from property-tax levies. 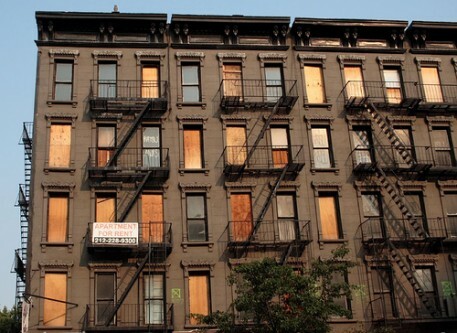 It’s worth noting that the data suggest that rent control benefits the well-connected much better than it benefits the very poor.